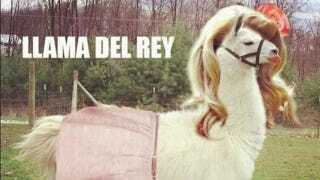 Long Live Llama Del Rey! I hope you had a good weekend and are raring to grab this week in your teeth and rip it a new one. But before that, kick back, relax, and have a nice chat in your evening open-thread. Here, culled from the internet, are a collection of links for you to enjoy and maybe talk about. You guys have seen the new trailer for Game of Thrones season two by now, right? - It's got Varys telling that parable that sums up the entirety of the series. Also, Tuvan throat-singing! Speaking of that, here's the best 5 seconds from all of Season one. - Eat it, Joff! "99 Luft Problems" - Heh. Thanks for sharing this, Max. "Will work on food" - heh. The Muppets attack FOX News. - Ha. Go Hollywood argues that The Hunger Games is all about small government. - Actually, I think it's the opposite - the books seem practically tailor-made for the occupy movement, to an occasionally distracting degree. Brits get arrested for making terrorist jokes on Twitter - Well, that was pretty dumb. A seriously amazing letter from a former slave to his former master - "Here I draw my wages every Saturday night; but in Tennessee there was never any pay-day for the negroes any more than for the horses and cows. Surely there will be a day of reckoning for those who defraud the laborer of his hire." The World's Largest Gummy Worm - Stuff of nightmares! And that's that! Have good commenting.